Assemblymember Muratsuchi launches re-election bid ahead of June primary. 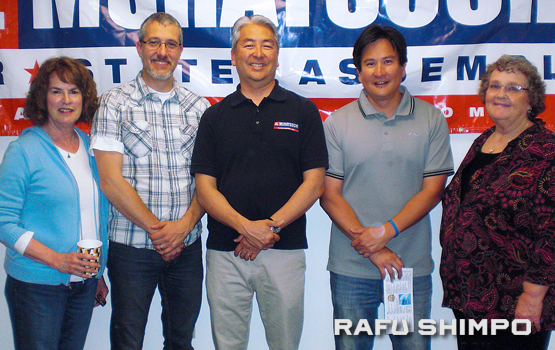 Assemblymember Al Muratsuchi (center) with fellow South Bay elected officials (from left): Palos Verdes Library District Trustee Kay Jue, Redondo Beach City Councilmember Christian Horvath, Palos Verdes Estates Mayor Pro Tem Kenneth Kao, and Torrance Unified School District Board of Education Clerk Terry Ragins. TORRANCE — Assemblymember Al Muratsuchi, a Democrat representing the 66th Assembly District, officially kicked off his re-election campaign at his Torrance headquarters on May 20. The incumbent faces fellow Democrat Caney Arnold and Republican Frank Scotto in the June 5 primary. The top two vote-getters will move on to the November general election. Muratsuchi, who has served as a deputy attorney general with the California Department of Justice and a member of the Torrance Unified School District Board of Education, was first elected in 2012, defeating Republican Craig Huey. In 2014 he lost to Republican David Hadley, and in 2016 he challenged Hadley and retook the seat. During a speech at his campaign headquarters, Muratsuchi thanked his wife Hiroko and their daughter Sophia. “They’re the ones that make a sacrifice whenever I have to go to Sacramento Monday through Thursday every week.” He also thanked his supporters, including Richard and Melanie Lundquist, who provided the office space. 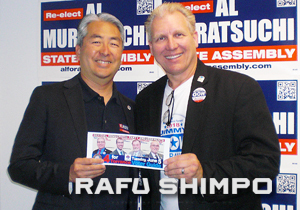 Al Muratsuchi with Torrance City Council candidate Jimmy Gow, chair of the city’s Social Services Commission. Regarding the controversial Torrance ExxonMobil Refinery, he said, “Last year I was proud to be able to get three of my bills signed into law, all bills designed to make the refinery safer. A bill to provide for more effective community alert systems in case of emergencies; another bill to have refineries pay for and install air-quality monitors in the community surrounding the refineries; and last but not least, a bill to require local first responders to work with a federal and state emergency responders so that we are better prepared in case of any emergency. In a rare move, President Obama endorsed Muratsuchi and two other Assembly candidates that year. Despite Muratsuchi’s victory, the mood at his election night party was subdued because of Hillary Clinton’s loss to Trump. He said that Scotto did not show up at a recent candidates’ forum, so the debate was between the two Democrats. Among those attending the kickoff were Redondo Beach City Councilmember Christian Horvath, Torrance USD Board of Education member Terry Ragins, Palos Verdes Library District Board of Trustees member Kay Jue, Palos Verdes Estates Mayor Pro Tem Kenneth Kao, and Torrance City Council candidate Jimmy Gow. Caney, a retired U.S. Air Force manager, was elected to the Harbor City Neighborhood Council in 2016 and ran for the Los Angeles City Council, District 15, in 2017, finishing in second place. Scotto, founder of Frank Scotto Towing, served on the Torrance Civil Service Commission in 1997, was elected to the City Council in 2000, and was elected mayor in 2010. He is a founder of the Torrance Police Foundation. “I am running to represent us in the State Assembly because I believe that I can work to keep our community safe, improve our environment, and come to the table to find solutions for issues that affect us where it matters, at home,” he said in a statement. Scotto’s endorsers include current and former mayors and councilmembers of Torrance, Hermosa Beach, Manhattan Beach, Rolling Hills Estates, Rancho Palos Verdes and Lomita. I’m not voting for Al Muratsuchi, his voting record is horrible, it’s an embarrassment to know he represents me. This is blatant racism when you promote someone just because they’re Asian.